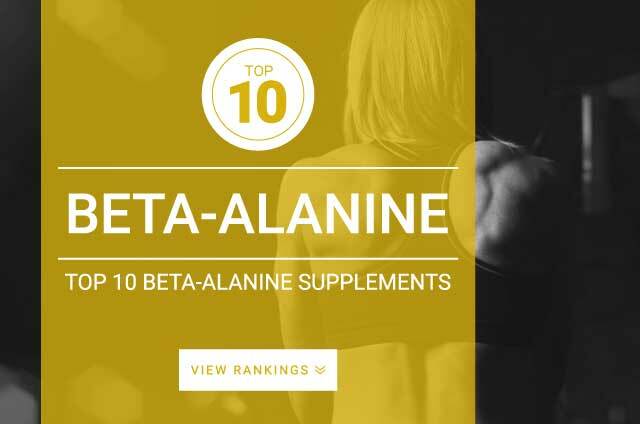 Onlinestrength analyzed 10 best-selling Beta-Alanine supplements in the United States. Our analysis quantified levels of beta-alanine, preservatives, artificial sweeteners and coloring agents. Beta-alanine is a non-essential amino acid that is produced naturally in the liver. When excess is supplemented through supplementation or through natural means such as food (beef, poultry) beta-alanine has been shown to enhance overall muscular endurance by prolonging lactic acid build up. Beta-alanine is taken up the muscle fibers where it combines with histidine to form a molecule called caronsine. Studies show that when the body has an increased store of caronsine in muscle fibers your body will be able to delay lactic acid build up for longer periods of time. During a workout set or any type of exercise your body will start to produce lactic acid. When acidity reaches its peak your muscle’s lose their ability to contract. This lactic acid build up prevents you from reaching higher repetitions, longer cardio sessions, longer sprinting distances, etc. By supplementing beta-alanine your body will have an increased store of caronsine in cells which will help keep your muscles protected from lactic acid build up. Thus, improving cardiovascular performance and muscular endurance. Beta-alanine supplements are most effective at the 2,000mg-5,000mg dosage range. Research shows that this is an adequate amount for your body to fully benefit from beta-alanine. Research shows that Beta-alanine as the clinically tested, Carnosyn is the most effective formulation of beta-alanine for physical performance benefits. Studies show that between 2-5 grams of beta-alanine supplemented daily may increase muscular endurance during prolonged exercise lasting between 60-240 seconds. Supplementation of beta-alanine is not timing-dependent and does not need to be taken before workouts to be effective. Beta-alanine is the building block of carnosine, the body uses this molecule to help buffer acid in the muscles which cause the onset of fatigue and muscle soreness. Prolonging the build up of lactic acid in the muscles will allow for you to workout/exercise for longer before needing to rest due to early muscle failure. Regularly supplementing beta-alanine has been shown to enhance muscular endurance and cardiovascular exercise performance. Beta-alanine as Carnosyn is the most popular and effective form of the supplement, preferably on its own without any additives. Studies show that additional ingredients like those found within Optimum Nutrition Beta-Alanine Powder do not improve the way beta-alanine performs and are considered to be unnecessary filler ingredients. The fitness industry standard of an effective dose of beta-alanine is 2,000 mg – 5,000 mg. Taking large doses of beta-alanine at once (1 – 5 grams) may cause a tingling feeling usually around the ears and forehead. This feeling is called paresthesia and is completely harmless.